You have an eye for art and you love collecting paintings. You definitely don't want to be culprit of destroying them, so you cringe and go to pricey framers in Kolkata. Well, not any more because this ace framer in Kolkata will come to your place to frame you precious piece of art. Looking for a good framer who won't burn a hole in your pocket to take care of your art? Framer Bachu Dhibar is here at your rescue. Working for one of Kolkata's popular framing stores (that costs a bomb for their services), Bachu has almost twenty years of experience under his kitty when it comes to framing. This ace framer (who's worked with several senior artists) will frame you prized artworks not only at a reasonable rate, but will also come over to your place to frame or deliver. Worried how to take your wall-sized artwork to the framer? Call on Bachu to get it done. Wood or fibre, he will do the frames just the way you want it, with whichever finish you desire. 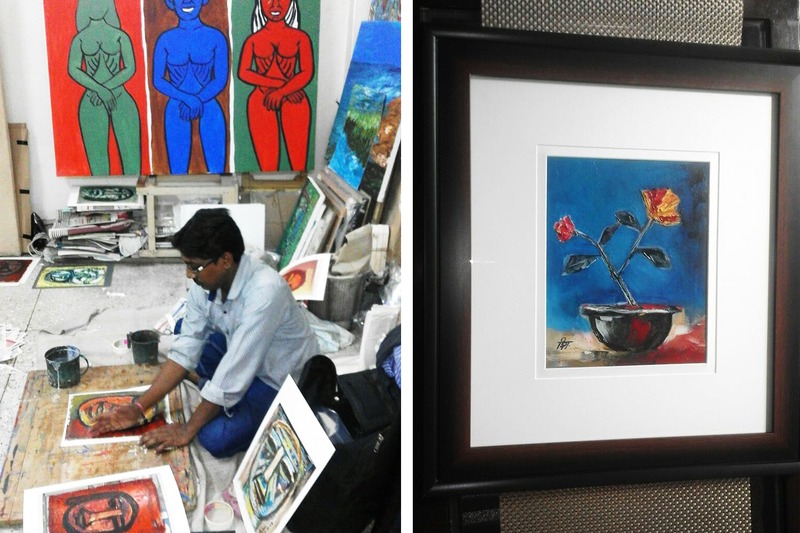 Prices for his services start at INR 350, and depends mostly on the size of the painting. So, frown no more and keep his number saved to call on him whenever you need. A busy artist himself, who handles several big exhibitions, it's best to let him know at least 5 days before you ask him to drop by.